This page ended up being so, so rushed. I actually considered skipping today's update so that I'd have the weekend to actually make it as good as it should have been, but here we are. Also, Buzzcut Mohawk Guy is me every time I gamble. If you head over my Patreon page and pledge one measly dollar per month to help support EverydayAbnormal, you'll get to see the original concept designs used for Asuka back in Chapter 3: "Life is a Battlefield," when they go up tonight! That's in addition to the tutorials, WIPs, and concept sketches still posted there! I think the page came out great! :D And it's always neat to see splashes of color come in now and then. Yeah, I think this is going to get around the camp pretty quick. 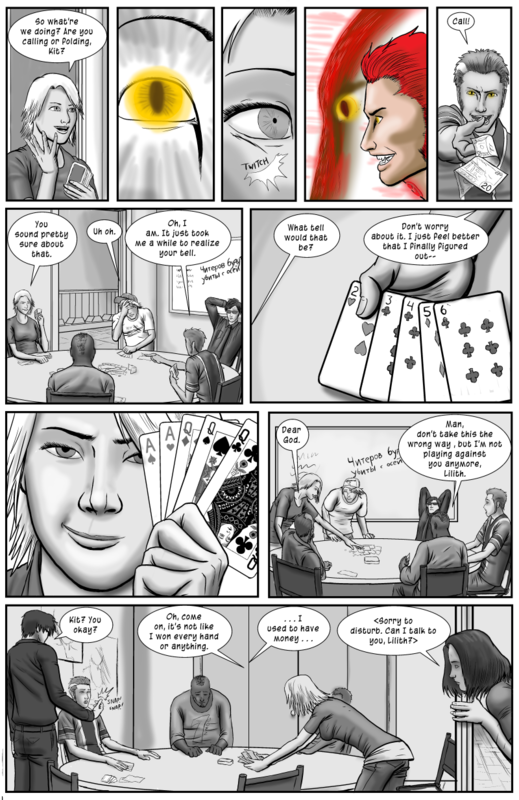 Lilith is going to take all your poker money, players beware! Bird Spirit Activate! ha, just had to say that. So, Lilith is the only thing they need to break a lesser god.